Over the past five years, NTH has become an extension of Dearborn Industrial Generation (DIG)’s Environmental, Health, and Safety Manager’s resources. We continue to serve as the go-to source for resolving complicated environmental and safety issues. 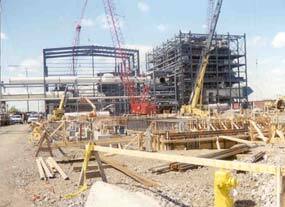 This equipment supplements local utility demands and serves as a replacement to the aging Rouge Steel Powerhouse. As the project progressed, the scope grew to include water discharge permitting, stack testing, and pollution prevention plans for both Storm Water and for Oil and Chemical Storage. NTH and DIG worked with Rouge Steel, Ford Motor Company, and Double Eagle Steel Company, to address the complex water supply and discharge system at the Rouge Complex.